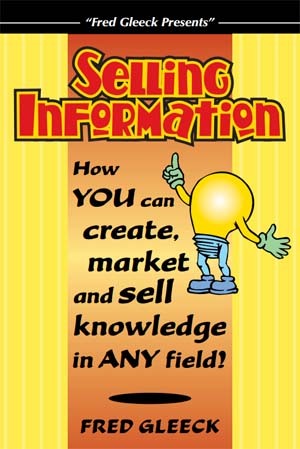 In an issue of Fred Gleeck Insights ezine from many years ago, my friend Fred Gleeck provided an outline for a good Internet one-page sales letter that would work for books, reports, audios, videos, kits, home study courses, software, and other information products. Follow this outline and you’ll create a great sales letter. Include a few stories, some detailed testimonials, and a lot of soulful honesty and you’ll knock the socks off your readers — and they’ll want to buy. Follow this one-page sales letter outline and you’ll create great sales letters. Check out what he is doing by giving away these books. Inside these ebooks, Fred provides sales copy and links to the other services, products, seminars, and workshops he offers. Sales copy has two components, the visible and the invisible. The visible is what you see on the page or on the site. The invisible is what the TRUTH is behind the copy. He mentioned how you feel when you read something and it just doesn’t sit right with you. Something feels strange or a bit off. The reason is because of the fact that what you’re saying and what is really the truth aren’t in alignment. There are the words on the page and then there are the silent words which speak to your heart that sit behind them. The truth! What this is going to make me do is to go back and re-write everything I’ve done. You can pay fancy copywriters to do an incredible job of hyping your product. In some cases it might even help increase your sales. Nothing will increase your sales more than copy that is written from the heart that is in INTEGRITY. This doesn’t mean you can’t sell like crazy. I’ve got some REALLY good stuff that I think everyone should I own. I feel that way in my gut and know it to be true. This system doesn’t say that you can’t or shouldn’t sell with all the zeal of a Baptist preacher if you’ve got something great to offer people. What the system says is that you better believe, in your heart, that what you’re saying is true or people will NOT believe it. They won’t be able to tell you why, they just won’t buy. They will feel an inconsistency between the words on the page or web site and what you really feel. The truth. This will make it so that people won’t buy. They won’t know why, but they just won’t! The lesson? Just write the truth. The truth as you see and feel it. People will then feel more comfortable about the copy you write. They may not be able to put their finger on it, but it will be more believable and it will increase sales. Forget the hypey and slightly untruthful copy. Adopt a writing style that makes sure that what you say and what is ACTUALLY true are in complete harmony. Net result? More sales? Is this common among people out there selling stuff either on or offline? Absolutely NOT. Book Marketing Tip: The lesson? Just write the truth. The truth as you see and feel it. Make sure that what you say and what is ACTUALLY true are in complete harmony. There are only 4 places to sit at a seminar. Front row all the way to the left, front row all the way to the right, last row all the way left and right. Why? Because when you ask a question you can be seen by the entire rest of the group. These are the only 4 spots with maximum exposure to the rest of the group. I tend to sit in the back at the corner which is closest to the door for a quick and easy exit if necessary. But any of these four locations makes it easy for you to be seen when you stand up to deliver your pearls of wisdom, subtly promoting your products and services. Get noticed at seminars: If you attend seminars, you have to know where to sit at any event. Some people never create information products because they feel as if they don’t know enough. They think that unless they are one of the most knowledgeable people in the field they have no right to produce the product. Two important thoughts on that: If you know more than 90% of the people out there, you have the right to create the product. You may even have the right if you know more than 80% of the people. Stop sitting around contemplating your navel and get going. Produce something. Anything. Get started. The toughest dollars to make are the first dollars.